8.1 A parliamentary inquiry of the scale of the Banking Inquiry is a complex project and requires significant behind-the-scenes work to support the public hearings leading to the final report. 8.2 The Inquiry required very specific and wide-ranging expert skillsets to conduct the investigation phase, to advise the Joint Committee in the conduct of public hearings, and to support the drafting of the report. The Joint Committee decided that a recruitment / head-hunting approach would be the best fit for the diverse needs of the Inquiry. novelty of the roles and the contractual arrangements – in order to enable a head-hunting approach, staff were employed on fixed-term contracts as “unestablished civil servants”. tight timescales to get the team in place – investigation team management took up duty on 1 December 2014, and the balance of the team members were mostly in place by early February 2015.
need to balance requirement for experience, knowledge and skills with the clear potential for conflict of interest – the Joint Committee had the final say in assessing conflict and its approval was required for all contract investigator appointments. approval of terms and conditions (Department of Public Expenditure and Reform, Civil Service HR Policy Division). approval of appointment of staff numbers at pay levels above the grade of Principal Officer (Department of Public Expenditure and Reform, Expenditure Policy Evaluation and Management Division). approval for the proposed recruitment approach (Department of Public Expenditure and Reform, Civil Service HR Policy Division and the Commission for Public Service Appointments “CPSA”). Preliminary interview with recruiter (where applicable). Interview with the Lead Investigators and Houses of the Oireachtas Service. Interview with the Chairman of the Joint Committee. Approval by the Joint Committee of the recommended appointment on the basis of the Chairman’s recommendation, candidate CV/profile and declaration of interest form. 8.5 The Joint Committee adopted a process for assessing conflict which included the completion by candidates of a declaration of interest form. A small number of candidates were not approved by the Joint Committee for appointment to investigator roles on the basis of conflict with the terms of reference of the inquiry based on their prior work experience and/or declaration. A key concern was that no team member should have worked in a senior management or key decision-making role in any of the institutions being inquired into by the Joint Committee through oral and written evidence. 8.6 Each member of the Joint Committee was entitled to employ a parliamentary assistant to provide the required support to the member in his/her capacity as a member of the Inquiry63.Every member of the Joint Committee availed of this entitlement. 8.7 The Joint Committee agreed a protocol to govern interaction and contact between members, their parliamentary assistants and the investigation team, including escalation to the Joint Committee and Chairman, during the Nexus Phase. 8.8 The team of approximately 50 support staff comprised a secretariat, a team of investigators and a legal team. Resources were scaled up or down as needed during the various phases. 8.9 The secretariat comprised staff of the Houses of the Oireachtas Service who provided general administrative support, procedural advice and communications support services to the Joint Committee. 8.10 The investigation team provided technical knowledge and expertise to assist the Joint Committee across the three main streams of the Inquiry terms of reference. Team members had backgrounds and experience in the areas of banking, financial regulation, and public service policy. The Senior and Lead Investigators were accountable to the Joint Committee for the investigation process. They were supported by a team of investigators comprising staff recruited on fixed-term contracts linked to the duration of the inquiry and civil servants seconded from relevant Departments. 8.11 The in-house legal team comprised a legal adviser from the Office of the Parliamentary Legal Adviser, along with a team of lawyers recruited on fixed-term contracts linked to the duration of the inquiry. An external legal team of three Senior and two Junior Counsel provided additional capacity and advice where needed. 8.12 Oversight and management of the Nexus Phase of the Inquiry was supported through a Steering Group, which met weekly and also held twice-weekly conference calls. 8.13 Expert support for the Context Phase of the Inquiry was provided by FTI Consulting in conjunction with Professor Karl Whelan, UCD, who were selected following an open tendering process. Expert support for the Relevant Proposal (scoping) Phase was provided on a pro bono basis by the following: Pat Casey, Paul Gorecki, Megan Greene, Cathal Guiomard, Conor McCabe, Colm McCarthy, Seamus McCarthy, Rafique Mottiar and John Shaw. 8.15 If they are to conduct effective inquiries, Oireachtas Committees need a resourcing model which will provide a flexible framework for scoping of inquiries, development of terms of reference and quick delivery of relevant expertise to Committees who have been established as Part 2 inquiries. 8.16 The Banking Inquiry was a pioneering exercise and had to build everything from scratch. The Joint Committee acknowledges that future inquiries may be more modest in their scale and ambition but believes that the basic model of the Banking Inquiry can be scaled up or down to effectively support most inquiries. 8.17 The Joint Committee recommends that the Houses of the Oireachtas Commission should agree an optimum staffing structure and terms and conditions with the Department of Public Expenditure and Reform to provide the necessary expert investigator and legal support for Committee inquiries in the next and future Dáileanna. removal of the requirement to seek an Excluding Order from the CPSA for staff employed to support inquiries. 8.19 As the first inquiry under the 2013 Act, the Banking Inquiry incurred a number of once-off, establishment costs. These included the development of a document management system to organise the significant volumes of documentation and evidence received by the inquiry. 8.20 The inquiry also required suitably secure accommodation adjacent to Leinster House. This required work to be conducted by the Office of Public Works in setting up the Inquiry Support Centre in Agriculture House, along with some adjustments to the layout of Committee Room 1 in LH2000 to facilitate the conduct of public hearings. 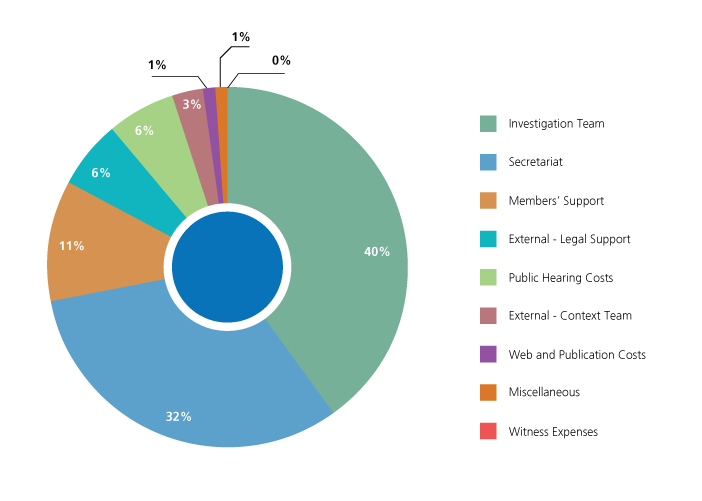 8.21 The Inquiry running costs consisted in the large part of the salaries of support staff for the Joint Committee and members (some 83% of the total), along with external legal advice and public hearing costs. 65. Costs Include all costs incurred to 31 December 2015 and addiional estimated costs to the date of reporting in January 2016.